Fixed secondary cities local time issue, for people whom enforced custom timezone setting, you can set it back to automatic. Android Weather, the quick and accurate weather app, provides detailed weather for all cities worldwide, it searches your address and locates cities quickly, and provides the current temperature, current weather condition, humidity and wind speed and direction, in addition, five, ten days and hourly weather forecast. 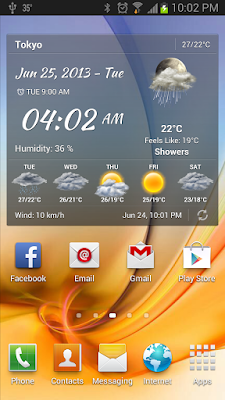 Android Weather, is 100% free, and it comes with many cool widgets, portrait and landscape user interface. 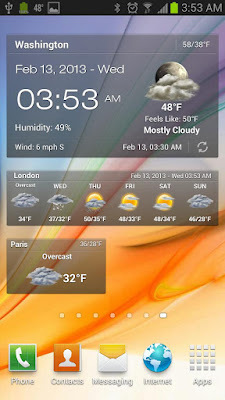 Android Weather comes with different widget sizes, 2×1, 4×1, 4×2 and 4×3 for normal screens, and 5×1, 5×2 and 5×3 for large screens like Galaxy Note and tablets. Android Weather supports a wide range of Android phones; it supports Android Version 2.2 and higher. - Home screen widgets, 5×3, 5×2, 5×1 for large screen only and 4×3, 4×2, 4×1 and 2×1 for all screens. - Automatic update intervals are: 15 min, 30 min, 1, 3, 6, 9, 12 hours and Manual update. - Localized to English, Dansk, Deutsch, Ελληνικά, Български, Suomi, Nederlands, Slovenčina, Slovenščina, Svenska, Română, كوردي ,العربية, Français, Hrvatski, Türkçe, Čeština, Español, Italiano, Português, Magyar, Pусский, Polski, Português(Brasil), Lietuvių kalba, Việt and 中文.